﻿﻿﻿﻿﻿Battle against invasive plants opens up this bass-filled reservoir. ﻿﻿﻿﻿﻿Sheldon Lake started out as simply Carpenter’s Bayou, a watering hole in the countryside of northeastern Harris County. Through the years, this tributary of Buffalo Bayou has developed into a reservoir, a fish hatchery, a wildlife management area, a birding and waterfowl hot spot and an urban home for the American alligator. Today, this 2,800-acre state park and environmental learning center is surrounded by one of the nation’s largest metropolitan areas, Houston. The park serves more than 60,000 visitors annually, including inner-city and suburban school children who have limited exposure to nature and the outdoors. 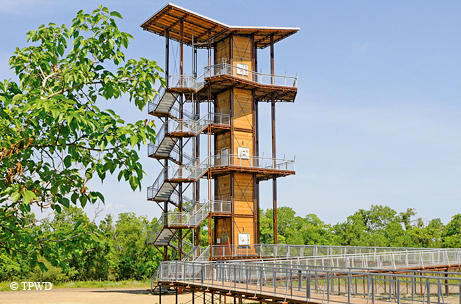 Most recently, the outdoor oasis became the home of the John Jacob Observation Tower, a striking 82-foot, elevator-accessible observation deck that rises above the landscape to provide dramatic panoramas of the lake and surrounding marsh, and all the way to the Houston skyline, 15 miles away. Sheldon has a unique story to tell. Although Sheldon Lake is a battleground, that battle was not like the one commemorated by San Jacinto Monument — which, by the way, can also be seen from the Jacob Tower — but rather more of an ecological conflict. Despite Sheldon’s convenient proximity to lots of willing anglers, people had practically forgotten about the fishing there, understandably, as non-native invasive plant species had just about taken over the impoundment in the last 25-plus years. The lake had been covered in an impenetrable mat of hydrilla, water hyacinth and — perhaps the worst of all — giant salvinia, save for the occasional cleared patch. Forming a mucky green canopy across the lake’s surface, this dense vegetation made it virtually impossible for anglers to access the more than 1,000 surface acres, denying them the many large game fish, especially largemouth bass, in the lake below. Similar situations plague other lakes in Texas (like the more famous Caddo Lake in the northeast part of the state) and around the country. Invasive species pose a real and costly threat not only to outdoor recreation, but also to the health of native ecosystems. At few places was it more visibly evident than at Sheldon Lake. The Texas Parks and Wildlife Department applied state-of-the-art treatment regimens to attack the noxious invaders but leave most native plants unaffected. The treatment allows sunlight to penetrate the water’s surface so native species can return and flourish. The water is no longer a jungle but an enjoyable lake. Sheldon has provided a glimmer of hope in the ongoing struggle to combat these aggressive alien species. Sheldon Lake State Park is located at 15315 Beaumont Highway (Business 90) at Park Road 138, two miles east of Beltway 8 or two miles west of Sheldon Road. For more information, visit www.tpwd.state.tx.us/sheldonlake or call 281-456-2800.